Hello supporters and interested parties. It’s been two months since I’ve posted an update, but let me assure you, there isn’t a week that goes by that I’m not working on the film in some way. I apologize if you feel things are moving slowly, but I must say, I will not release a film that I feel is not complete. This story has taken many turns and new revelations are happening almost daily. Just in the last two months new findings have caused more controversy, solidified theories, and have given rise to new questions. This story is still evolving! This is exciting! With that being said, I think the finish line of principal photography is in sight. What should be the final interviews will be taking place this March. I am very pleased to announce that we will be interviewing Warren Bernard this Sunday. Many of you will know Mr. Bernard as the Executive Director of the Small Press Expo. Warren is also a comics scholars and historian and has very recently written an expertly researched article that explores how the Senate Subcommittee on Juvenile Delinquency came to fruition (“Bloody Massacre: How Fredric Wertham Public Backlash and the 1954 Senate Delinquency Hearings Threw Comics on the Bonfire”). It was published in the latest Comics Journal. The journal’s website has posted all of the article’s citations: Warren Bernard’s Citations and Fredric Wertham Documents. Mr. Bernard’s interview will be followed a week later by Amy K. Nyberg, author of The Seal of Approval: A History of the Comics Code. This interview has been a long time in coming. We always knew the film was incomplete without Dr. Nyberg’s input and we have finally been able to schedule it. Her book was one of the first to look at this period of comics history. And finally, we will be interviewing Carol Tilley two weeks later. Dr. Tilley’s newest research was published in Information & Culture: A Journal of History. Her article, “Seducing the Innocent: Fredric Wertham and the Falsifications that Helped Condemn Comics” has received much attention in the last two weeks as she has found evidence that Wertham manipulated, changed, and fabricated data for the publication of Seduction of the Innocent. As I mentioned early, with the opening of Wertham’s archives, new information is presenting itself. 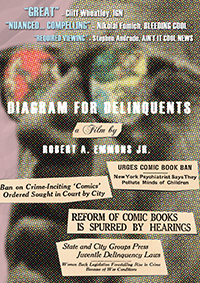 Lastly, as I have mentioned in the past, Diagram for Delinquents will incorporate animated sequences that use the actual court audio from the Senate Subcommitee Hearings on Juvenile Delinquency and Comic Books. Animation is a difficult, tedious, and time-consuming process. Luckily we are working with an animator whose talents are worth the wait! Hailing from Brooklyn, NY, Jason Clarke brings an aesthetic that really moves the animated sequences into the realm of comics. Jason is a designer, animator, illustrator, everythingator and this really brings a cohesiveness to his work. Please see more of Jason’s work at his website: THIS IS JASON. Just this week we received a rough version (there are missing elements and movements that will be in the final version of this clip, as well as the remainder of the sequence) of one of the film’s sequences. It’s followed by an interesting exchange with Kefauver. Here is a court room photo of Wertham at the witness table giving testimony to the presiding Senators and other court officials. Next to that is the remainder of this man. All I say is that quite apart from the disgust that it arouses in us – and I am a doctor, I can’t permit myself the luxury of being disgusted ─ I think this kind of thing that children see over and over again causes this ethical confusion. That seems to be the end of that comic book story. Yes. I should add that it says here, “The End.” “The End” is this glorious meal, cannibalism. So it did not have a very happy ending. Well, the comic book publishers seem to think it did. They made a lot of money. Tagged Diagram for Delinquents, Fredric Wertham. Bookmark the permalink. RSS feed for Robert A. Emmons, Jr.
Robert A. Emmons Jr. is a documentary filmmaker focusing on American popular culture and history. His films include Enthusiast: The 9th Art, Wolf at the Door, Yardsale!, Goodwill: The Flight of Emilio Carranza, and De Luxe: The Tale of Blue Comet. His Goodwill was screened as part of the Smithsonian exhibition "Our Journeys / Our Stories: Portraits of Latino Achievement," won Best Homegrown Documentary Feature at the 2008 Garden State Film Festival, and led to him receiving Mexico's Lindbergh-Carranza International Goodwill Award as a "Messenger of Peace." From February to August 2010, Emmons created two short documentaries a week; the 52 short documentaries formed the weekly internet series MINICONCEPTDOCS. His print work focusing on electronic media, documentary film, and comic books include Who's Responsible Here? Media, Audience, and Ethics (Cognella, 2009), The Encyclopedia of Documentary Film (Routletdge, 2005), Small Tech: The Culture of Digital Tools (University of Minnesota 2007), and The Encyclopedia of Latino and Latina History (Facts on File, 2010). He teaches film, new media, and comics history at Rutgers University-Camden, where he is also the Associate Director of the Honors College. For more information, visit robertemmons.com. See more, including free online content, on Robert A. Emmons, Jr.'s author page. I’m sure I’m speaking for a number of people out here in the audience when we say please take your time and create the documentary as you envision it–not a rushed for completion film. This has the potential to be a great supplement to comics scholarship surrounding the censorship of comics, and I can’t wait to see it once it’s ready. Seconded, I am as excited about this film now as I was when it was announced. You are making a critical examination of one of the most important events in the history of a medium that raises strong passion in its supporters. Taking time to care about details is what passionate people do. he attributed to personal clinical research with young people—for rhetorical gain. Even though she brings some new evidences, as she states, I suspect she reinforces that picture you are trying to give a new interpretation over in your doc. I’m sorry Robert, I wrote my comment before reading your post. Forget it.